It would be nice if it was as simple as making sure kids have access to books, and modeling the enjoyment of reading. Certainly these are important factors, but they don’t do it all. After those magical, clickable words ‘read more’ (so appropriate in this case), I’ll give a few suggestions and a few links that may help in the care and feeding of the bookworms-in-the-making in your life. Does anyone else remember those agonizing times in reading period at school when the teacher would go around the room and everyone would have to read part of the story aloud? Reading came easily to me, so my turn wasn’t a problem — I agonized on behalf of those who struggled to sound out the words, and who sighed with relief when their turn was over. I sometimes wonder if they ever learned to read for pleasure. That teaching method was certainly destined to make those kids feel even worse about their difficulties with reading than ever. 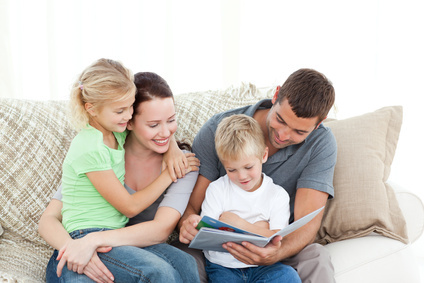 As for reading with them, snuggling with a book in one hand and your child in the crook of your arm is bound to connect reading with love, warmth, good feelings. Giggling over a story, using exaggerated voices, just having fun with books, can create those desired positive connections. My mother taught kindergarten for a couple of years, and she said she could tell right away at the beginning of the year which children had been read to and which hadn’t. The ones who had been read to were better able to concentrate, were more attentive, were more ready to learn. If it seems a physical struggle to read, if the child constantly stumbles over words, mixes up syllables, throws down the book in frustration more often than not, be sure to check the possibility of a learning disability. These are often picked up in school, but parents and caregivers can play an active part in seeking out the best help for a child. Don’t be a snob! That may seem like an odd thing to say when talking about reading, but quite often people don’t want their kids to read what seems to them to be trash, and so they discourage the one thing that child might actually want to read. When I was a child, I read and re-read my Bobbsey Twin books. I actually learned quite a bit from them — I doubt that my sixth grade teacher realized that the reason I was so well-versed about Washington, D.C. was because I had vicariously accompanied the Bobbsey Twins to Washington so many times. Yet our local librarian was horrified when Mum asked if they had Bobbsey Twin books. They didn’t promote reading such things! Thankfully, libraries are more open to such series now. If your child wants to read comics, or manga, or other sorts of graphic novels, encourage them! Finding pleasure in reading one type of book may well lead to the awakening of an enjoyment of reading. It’s no secret, nor is it a surprise, that after the success of Harry Potter, many more children were reading for pleasure than had been before. Arrange trips to science museums, baseball games, fun fairs, whatever catches your child’s attention — then find books about the same subject. Have them see that reading can expand on their enjoyment of other pleasures. Make up your own stories, write them down, illustrate them. Have a book-signing party and invite the whole neighborhood. Play games in the car — we played “Geography” almost incessantly on long trips. It wasn’t exactly reading, but it was giving me a fluency with the alphabet and with words and maps, as I tried to think of a town, city or country that began with the last letter of the place said before my turn. Lest I seem to be speaking only to parents and caregivers, there are plenty of ways we who don’t have children can help raise bookworms. And, unfortunately, there are plenty of kids whose parents aren’t interested in reading with them. Many schools (especially inner city schools) have programs where volunteers work one-on-one with children during school hours to encourage the development of reading skills — they’ll train you, don’t let lack of teaching experience stop you. If you know a neighborhood child who could use some one-on-one time, offer to take the child to the library, or to the bookstore with the promise that they can pick their very own book and you’ll read it to them, or regularly drop in with a stack of books. Volunteer for story time at a library, or day care center. Whoever you are, or however you reach out to kids to get them keen on books, maybe you can be known as the family, or the neighbor, or the teacher, who celebrates author’s birthdays, using the blog of Eric VanRaepenbusch, Happy Birthday Author as inspiration. Other suggestions are welcome! Please feel free to share in the comments. Same interview uploaded to YouTube by Adolescent Literacy (a sister organization of Reading Rockets), interview is in full, but without the background information. This is a wonderful article Beth. Despite all my encouragement when my four children were young (I read to them all every day as I am an avid reader and lover of books) only one became an avid reader. The other three now read a little more, but are by no means bookworms. My grandchildren on the other hand, are all avid book lovers. Whenever they visit, they always end up on the couch with a pile of books. My five year old grandson will even ‘read’ to his younger sister. I loved your link to Happy Birthday Author. What a great idea! And I especially love the idea of linking children’s other interests with reading. Many a young boy will read books about dinosaurs, or cars, or superheroes. And girls will read about horses, or dancing, or dogs. Many children’s movies these days also have companion books which can further interest them in reading about beloved characters. I will continue to encourage my children and grandchildren to enjoy reading, whatever form it takes. Thanks for your post, Beth. Thank you so much for linking to my post — and for the excellent post you wrote on reading, as well. You’ve just earned yourself an extra entry in the giveaway for Raising Bookworms! I was particularly delighted to read that your son is determined to read to his new daughter. YES! This is a great post, Beth. I’m especially glad you put in the “don’t be a snob” part. It’s so true! The important thing is that kids read, and they will try harder to read something they’re really interested in, even if Captain Underpants might not be mom’s first choice 🙂 I also think your point about starting young is important, but I don’t think all hope is lost if you didn’t. Everyone loves a good story. If Captain Underpants gets kids reading, that’s great! I know that reading aloud was a challenge for my daughter. Though intelligent when it came to sounding words out, her speech was impaired from early hearing problems that have since been fixed. Instead of being snobs, well, Papa Bear had a slight pout but got over it quickly, we got her into speech therapy. It took time, but she was soon able to read aloud with the same confidence as other children. Making sure to read with her and have her read independently also helped. As one with a hearing problem myself, I’m so glad you were able to get your daughter the help she needed, and that it was so effective. And I’m glad you pointed out another stumbling block to reading — if children aren’t hearing properly, that can have such an effect on their language acquisition and comprehension. Thank you, Angela! Excellent post! We always stressed the importance of reading to our two kids. Our son was a constant battle but eventually it paid off. He now enjoys reading. Thanks, Russ! I’m so glad that your son now enjoys reading — an other testimonial to the adage “never give up”. so, look around people. there’s a child out there who needs your help. Thank you so much, Jan, for your comments and as always, your support. I especially appreciate your sharing your personal story — that brings home the point of the need for outside-the-family mentors so much better than my words ever could. I’m so grateful that your eighth grade teacher finally provided that for you! I love this post! As a former teacher, I can say you are dead right about being able to tell which kids had been read to by a live human at home. I specify human, because some kids were read to by talking bears, CDs, talking books, and screens of all sorts. That doesn’t count! The kids who were read to by humans ENGAGED with me when I read to them. Eye contact, comments, laughing at the right times, covering their ears if I read the word “underwear” and other normal human (8-year old) behaviors like that. Kids not read to or read to by non-humans, stared at me. Happily, in a few weeks, they ALL understood that that daily oral reading experience with me was a time to connect, talk together, laugh together, groan together, predict, lament, relate, and love love love stories and words. Thanks to my Mom for our weekly trip to the library in Newark, NJ, and thanks to my 5th grade teacher Mrs. Nelson for reading aloud to us long after other teachers had decided we could read to ourselves…or not. Because of them, I became a teacher who read aloud, and an author, who continues to visit schools to read aloud and engage with kids so they can engage with words. Our sixth grade teacher read aloud to us every day after lunch, and I still remember her reading of My Friend Flicka and Thunderhead as some of my favorite moments of my school life. Thank you for all you have done and all you continue to do with kids! Wonderful article, Beth! I especially love the thought that any parent who has taken a taste of baby food and said “Yummmm!” convincingly has acting skills. I might have to steal that one! Thank you for the shout-out for Raising Bookworms (don’t add me to the drawing, of course! ), and for all you do on behalf of young readers and your fellow writers. Thank you so much, Emma! Feel free to “liberate” the acting skills comment! Raising Bookworms is so worthy of shout-out that I just can’t help myself. At the risk of sounding like the second part of a mutual admiration society, I so appreciate what you do for both readers and writers. You’re a gem. Beth, this is excellent advice, and advice I’ve tried to follow with my two small boys. My five-year-old loves to read the LEGO toy catalog. He is reading words like “victorious.” I thought about pushing level 2 readers on him, but thought better of it. Reading that LEGO catalog is such a joy for him! We also check out books on any subject the boys show interest in, Mars rovers, weather, etc., even if the subject matter or presentation is beyond them. Helping them “stretch” is good, and they are more willing to do it with a subject they are interested in. If the LEGO catalog is doing that for him, it’s absolutely great, and I love that you’re letting them stretch to their interests. I’m also glad that you decided not to push the level 2 readers on him. “Pushing” can so easily have the opposite effect. If he’s reading words like “victorious”, he’s already victorious in my book! Well done! I wish more people would encourage kids to read what THEY want. My cousin was telling me that her step-daughter loves reading graphic novels, but was marked down by the school because she wasn’t interested in reading newspapers and magazines….! I figure that kids will read what they love, and should be encouraged to do so. Oh what a shame to mark a child down for that. Reading is reading! I’m with you, encourage kids to read what they love. Thanks for sharing!